Author(s) Hyman, Steven E.; Malenka, Robert C.; Nestler, Eric J. 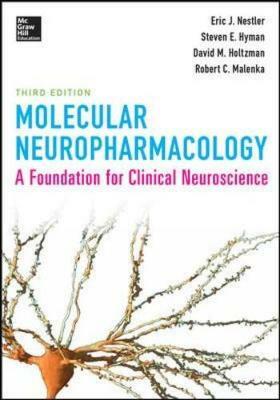 GAIN A COMPLETE UNDERSTANDING OF NERVOUS SYSTEM FUNCTION AND ITS RELATIONSHIP TO HUMAN NEUROLOGIC DISORDERS Molecular Neuropharmacology first reviews the fundamental biochemistry of the functioning nervous system and then describes how nerve cells communicate with one another through numerous types of neurotransmitters involving amino acids, monoamines, neuropeptides, and neurotrophic factors, among several others. The neuropharmacology and neural circuits that underlie complex behaviors as well as major neural disorders are also discussed as are the drugs used to treat those conditions. In the final section, the authors use the concepts presented in the first two sections to explain how irregularities in the biochemistry of neuronal interactions can lead to a wide array of clinical manifestations. FEATURES NEW chapter on neuroinflammation All chemical structure illustrations have been redrawn and improved Fully updated to reflect the latest breakthroughs and new drugs The most well-written and easily understood work on the subject More than 300 full-color illustrations!